Do pigeon droppings pose a health risk? The most unpleasant aspect of unwanted bird infestations is their waste – messy and unsightly, it can also pose a potential health problem. While no business or house looks good covered in unsightly bird droppings, the potential for spreading disease is far more serious. It goes without saying that the worse the problem the higher the likelihood of contamination. Psittacosis – also known as parrot fever, Psittacosis, mainly affects birds associated with the parrot family but is also common among pigeons. It is spread to humans by being inhaled through contaminated dust. Humans contaminated with the disease suffer flu-like symptoms that can include headache, joint pain, diarrhoea, fever and vomiting. It can develop into pneumonia and, if undiagnosed, or untreated can cause serious health problems. Symptoms take between five and 19 days to take hold after exposure and once diagnosed Psittacosis can be treated with antibiotics. Salmonella – A form of food poisoning, salmonella can cause vomiting and diarrhoea, which can lead to dehydration. It usually clears up without treatment, although in the case of vulnerable patients or severe dehydration medical intervention may be needed. Pigeons can carry salmonella, which can be passed to humans if food or water becomes contaminated with bird faeces. Cryptococcosis – This again can be inhaled through infected pigeon droppings and causes respiratory illness. This fungal disease is very serious in people with a compromised immune system and needs urgent medical attention. 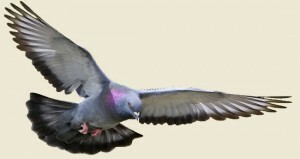 Histoplasmosis – This is another fungal disease that can be spread through infected pigeon droppings and humans become infected by inhaling contaminated spores. The symptoms are described as being similar to the common cold, with no serious illness occurring as a result. Pigeon droppings are difficult to get rid of safely – power washing for example lifts the airborne disease carrying matter into the air. The safest option is to call in experts, who will clear the area thoroughly and offer advice on controlling bird infestations. Contact Total Bird Control today for more information on bird decontamination.